The area around the heavily polluted Gowanus Canal is undergoing big changes. GOWANUS — The real estate developer building one of the tallest skyscrapers on Manhattan's Billionaires' Row is poised to make the biggest impact on development along the Gowanus Canal, according to a DNAinfo New York review of all of the property records abutting the Superfund site. Investors have poured at least $440 million into buying land on the polluted waterway and more than a third of the properties have changed hands in the past decade, according to an examination of records for the nearly 130 properties along the 1.8-mile canal. The current owner of the most land along the canal is developer Property Markets Group, which is now partnering with JDS Development Group to build the 82-story tower at 111 W. 57th Street, soaring 1,428 feet atop Manhattan's landmarked Steinway Building. But other big-name developers also have a presence in the neighborhood, including Kushner Companies — helmed by the family of President Donald Trump's son-in-law Jared Kushner — as well as Forest City, Alloy Development and Two Trees. Property Markets Group has been buying properties along the Gowanus Canal since 2012 and is currently in contract to buy a $50 million parcel near the elevated F/G subway tracks. PMG has spent at least $29 million acquiring eight lots along the canal over the past five years, and has agreements to purchase all the waterfront lots between Degraw and Union street on the west side of the canal, records show. Several large waterfront parcels are still in the hands of longtime local businesses such as Monandock Construction and Architectural Grille. The individual with the most waterfront property is Daniel Tinneny, whose father once owned Vidan Auto Salvage yard on Bond Street. 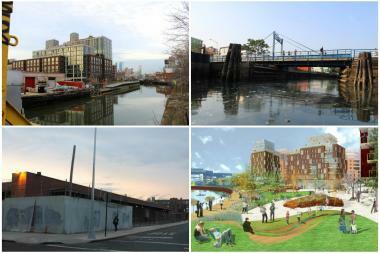 ► Forest City, the developers that brought the Barclays Center to Brooklyn, were early investors in Gowanus. In the early 2000s, FC considered building a mall and movie theaters, then an IKEA, before building the Lowe's that fronts the canal at Second Avenue and 10th Street. Once the home of a manufactured gas plant, the property underwent $3 million in environmental cleanup work before it was developed, according to press reports at the time. FC declined to comment on whether the company has plans to redevelop its property if Gowanus is rezoned. ► Kushner Companies, the real estate company owned by Trump's son-in-law's family, partnered with SL Green Realty Corp. and LIVWRK in 2014 to buy the entire block of Third Street across from the Whole Foods market for $72.5 million. The developers say they plan a "game-changing" mixed use project there, which could include a 280,000 square foot office and retail building, according to plans filed with the state. First they plan to rid the soil and groundwater of contaminants including PCBs and lead, according to documents filed with the state Department of Environmental Conservation. ► Midwood Management, the developer that's converting a Park Slope parking garage at 800 Union St. into high-end residences, dropped $6 million in 2014 to buy a waterfront building on Degraw Street that's leased by the film studio Eastern Effects to film shows such as "The Americans." Midwood also owns 261 Bond St., currently home to an artist's studio. ► Not all of the owners are equally easy to track down. Most make their purchases under the cover of LLCs. A pair of companies based in the Cayman Islands, Matthews Investments Ltd. and Moorgate Investments Ltd., have owned a waterfront building at 198 Douglass St. since 1998. ► Lightstone paved the way for residential development on the canal with its 365 Bond luxury rental building, where amenities include a yoga studio and lifestyle director. More than 56,000 people applied for a chance to rent the building's affordable units. State regulations prohibit tenants from digging gardens at the property, because they may expose themselves to lingering contamination in the soil, which underwent intense cleanup prior to development. Gowanus is still zoned mostly for manufacturing, which means developers are limited in what they can do with their property. Those who are embarking on projects now are creating office space (which is allowed in manufacturing zones) by turning former industrial buildings into workspaces for tech, advertising, marketing and information services companies. More is on the way. Plans filed with the state's Brownfield Cleanup Program, which DNAinfo obtained through a Freedom of Information Law (FOIL) request, show developers and property owners are considering office projects throughout the neighborhood, though those plans are subject to change if a rezoning is approved. Other new developments in the works near the canal include at least one building for working artists — the former power station known as the "Bat Cave" which which world-class architects Herzog & de Meuron are transforming into the PowerHouse Workshop; and one for "makers" — a 13-story building for small manufacturers on Third Street. Property Markets Group — which is also building a 50-story condo on a South Florida beach with "unobstructed ocean views," according to the company's website — will make water a focal point for whatever the developer builds in Gowanus, said principal Richard Lam. "We know the waterfront is going to be a key part of any development over there, and giving access to the public and making it a useful and active space," Lam said. PMG won't decide the specifics of its development plans until after the Department of City Planning's study of Gowanus is complete, Lam said. Broadly speaking, PMG foresees building a mix of market-rate and affordable rental housing, "maker" spaces for light manufacturing and community facilities such as schools, which are currently in short supply in Gowanus, Lam said. The company and its representatives have been participating in a series of public workshops where community members have told city planners what they want to see in Gowanus. Lam's takeaways from those meetings has been that locals want affordable housing and access to the canal, he said. PMG, which has offices in New York, Miami and Chicago, has never built affordable housing in New York, but has done so in Chicago, PMG spokesman Ethan Geto said. The developer has met with the Fifth Avenue Committee, a neighborhood nonprofit that advocates for low-income tenants, and is "exploring the possibility of bringing FAC on board to manage PMG's tenant recruitment for the affordable units," Geto said. The developer is also working with architect Fred Bland of the prestigious firm Beyer Blinder Belle to create a master plan for all of its Gowanus developments. The firm, internationally acclaimed for its work restoring landmarked buildings, was recently selected to upgrade the Frick Collection building. PMG chose to work with Bland because of his track record creating buildings that are well integrated with their surroundings, said Geto, who added that Bland is both an architect and urban planner. "Fred was a very, very conscious and deliberately arrived at choice by PMG," Geto said. "His firm creates major concepts and visions for an area and really understands the various land use possibilities and opportunities." Beyer Blinder Belle's vision for Property Markets Group's Gowanus developments includes the idea of having buildings with "porous" lower levels, Lam said, meaning that they will not block public access to the canal. The concept will differ from other waterfront developments in Brooklyn where a monolithic building sometimes surrounds an interior courtyard that's not publicly accessible, Lam said. PMG has also been meeting with the neighborhood nonprofit Gowanus Canal Conservancy, which advocates for creating unified greenspace along the canal. "We've already had a lot of discussions with the Gowanus Canal Conservancy to marry our visions of how the waterfront can be most accessible and well-planned," Lam said. "We are proponents of having a cohesive, readily accessible waterfront for the community." Fouled by more than a century of dumping from nearby industrial businesses, the Gowanus Canal was declared a federal Superfund site in 2010. The U.S. Environmental Protection Agency is leading the canal's cleanup, which is just getting underway. Before President Trump took office, the cleanup was slated for completion around 2022, but that timeline is up in the air as the EPA faces budget cuts. DUMBO-based developer Alloy had plans to build a canal-side creative office complex on Nevins Street, but scrapped the idea when the property was selected to house one of the sewage tanks. The canal isn't the only contaminated site in the neighborhood — the land that surrounds it is riddled with pollutants as well. There are about a dozen properties across the neighborhood where developers or owners have applied to participate in the state Brownfield Cleanup Program, meaning that they plan to clean contaminated land and then develop it, according to records DNAinfo obtained with a FOIL request. The Brownfield Cleanup Program gives developers financial breaks in exchange for building on polluted property. Whole Foods used the program to get nearly $13 million in tax credits for building its first Brooklyn store on Third Street and developer Lightstone participated in the program when building the first residential development on the banks of the canal. Several other sites indicative of the neighborhood's possible shiny future will be de-contaminated under the Brownfield Cleanup Program, according to state records. Those sites include the Bat Cave, the property around the popular wedding venue The Green Building and the future site of the Gowanus Green/Public Place affordable housing development. EPA officials told community members at a recent meeting of the Gowanus Canal Community Advisory Group that they're in discussions with the developers of the PowerHouse Workshop about remediating PCB contamination at the property. "We'll look at the data once they complete the [Brownfield Cleanup Program] and then we'll look at whether we require anything beyond that," EPA's Christos Tsiamis, who leads the canal's Superfund cleanup, told DNAinfo New York. "Our interest is to ensure that the site after cleanup does not present the potential of a recontamination source for the canal." A note on the map: Information on the map is drawn from ACRIS, the Department of Buildings, the state Department of Environmental Conservation, and news reports. Special thanks to CUNY's Center for Urban Research, creators of the OASIS NYC map.